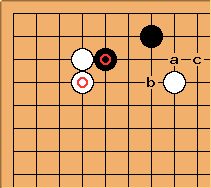 Whereas contact moves are considered bad for attacking (see don't attach when attacking), they are very useful when playing in the opponent's sphere of influence. The reason for both is that contact moves in general will make both players' positions stronger. When you are attacking, making the opponent stronger is the last thing you want, but in an invasion, or when you are defending your own weak position, strengthening the opponent is much less problematic - he is already strong, and giving him a bit more won't hurt that much. On the other hand, strengthening your own stones, and giving them the maximum amount of space, is often useful in these contexts. This is discussed in Attach To The Stronger Stone In A Pincer, but it seems like it would apply here, too. Bill Spight: This is a very strange diagram. The black stone is on the second line.